The choice of colours that you use in your work can make or break your final piece. I have always used mixes of colours- harmonious or contrasting, and have played around with trying to achieve the perfect shade. 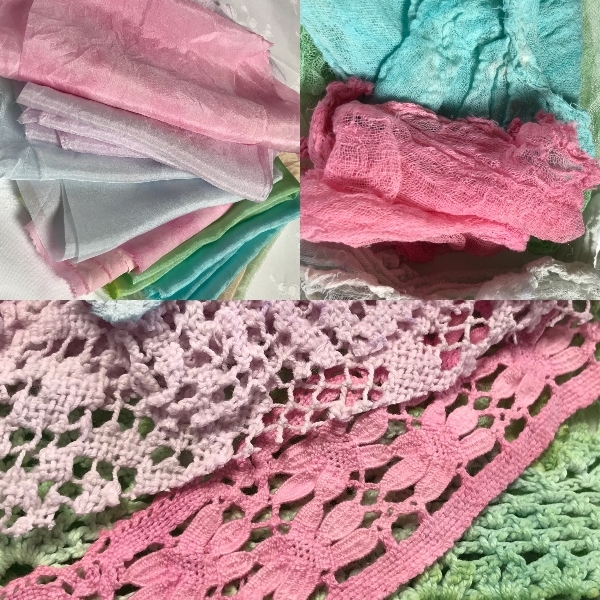 Vintage lace and linens dye brilliantly. 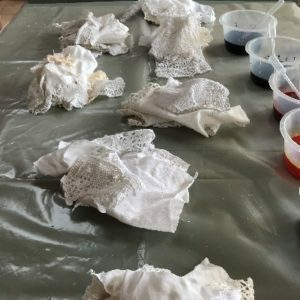 I sometimes use emulsion paint which is easy to create the right colour as the choice of tester pots is huge but this can make the lace feel quite brittle and hard. also, if you wash it out too much, you wash out all of the colour, so it is not ideal. Natural dying is wonderful and I can create beautiful subtle vintage pink using avocado skins. But using procion dyes is great fun if you seek to achieve vibrant and lasting colour. 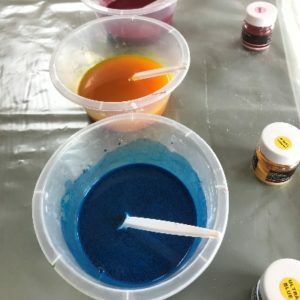 This is how I use the dyes but there are many variations. 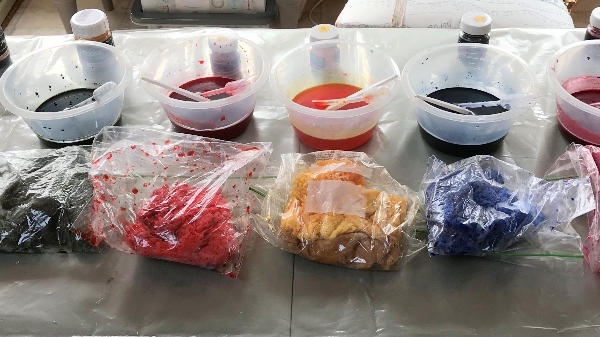 The main ingredients are: procion powder dyes, soda ash and cooking salt. You will also need: A selection of fabrics, lace, threads; a jug for water; plastic measuring spoons; plastic containers; self seal plastic food bags; and pipettes. I wear rubber gloves. You will need at least 3 colours of procion powder- red, blue and yellow. These are the primary colours and from these three colours many others can be made- orange (red and yellow), purple (red and blue) and green (yellow and blue)- then there are all the variations. Different shades of blue mixed with yellow can create very different shades of green for example. 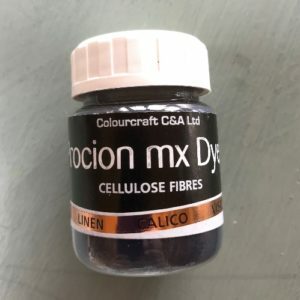 I use these dyes from Colourcraft. You can easily buy a pack from amazon which will come with directions, soda ash and salt. These are fibre reactive dyes so are often used in industry. It may seem like a small jar but a tiny bit of powder goes a very long way in my world. If you’re clumsy and drop particles of the powder onto the table, wipe it off immediately. It will spread like mad and appear on random pieces of fabric- driving you nuts! In each pot mix, 1 teaspoon each of procion and soda ash with 2 tablespoons of salt. The soda ash acts as a fixative and the salt pushes the colour deep into the fabric. 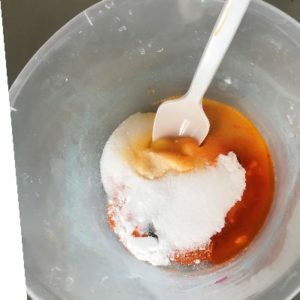 Add a small amount of warm water and paste it down using a plastic spoon or brush- get rid of the lumps until it’s smooth. Then add 100ml of warm water. Do this to all the colours, so that you have several pots all ready for use. Get your mix of fabrics ready in small piles, have a selection in each pile. Rinse each pile with water and squeeze out, then pop into the bag. Now for the playing! 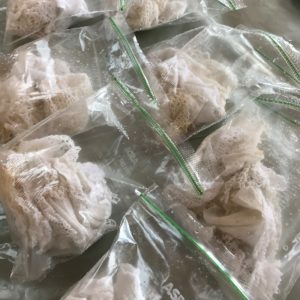 Just add the dye liquid to each bag. I use a pipette as I can control the amount I add and it is less messy than a spoon. Add enough to cover the fabric, and squish away. Press and move the fabric around. You’ll soon see if there is an area you’ve missed, so just add more dye. Once you’ve agitated it enough to have complete coverage, seal the bag and leave it for 30 minutes. Now empty each bag into a sink and rinse thoroughly with warm water until the water runs clear. Squeeze well and lay flat, or hang up to dry. I often leave mine on my aga as it dries so quickly. To use up rest of the dye, add some water in each bag to water down the dye. This produces paler shades of the same colours. 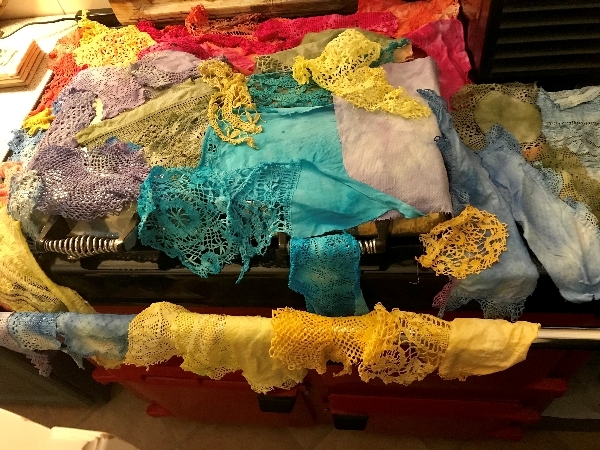 At the end of the session I’m aiming to have pieces of fabric and lace with several shades of each colour.